A few years ago, back in 2007 when I started using Linux as my primary operating system, I had a few itches to scratch because I missed my handy windows utility programs I’d become grown to. One of those utilities was TCPView which monitors incoming and outgoing TCP connections. Hence, a new project was born: KonnectionMonitor. 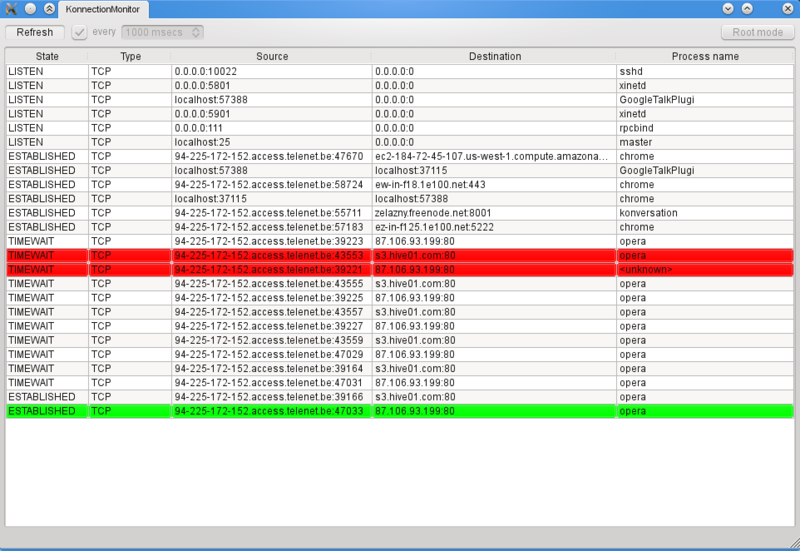 It’s goal was to mimic the TCPView utility on Linux/KDE. One remark: if you know TCPView, you will currently miss the close connection command in KonnectionMonitor. I’ve looked into ways on how to implement this on linux and there is no obvious way to do that (there is no api function). The only solution coming close to that, is sniffing the network and sending a RST (reset) packet (which in turn involves some other low level network tricks to be able to send a valid packet to the right host). I’ve already started experimenting with libpcap. It should be doable, stay tuned. For now, we have version 0.1 which can be downloaded from kde-apps.org. The source is on gitorious. Auto refresh respecting server-side request throttling. Without further ado, Telemeter plasmoid v0.1 is released, go get it at kde-look.org!